History and family go hand in hand for Walter Nathan. In 2006, the Chicago businessman visited his father’s native town of Gau Algesheim (near Mainz) and found the Jewish Cemetery there in dilapidated condition after years of neglect and wanton vandalism. Nathan took action and contacted the Mayor. They agreed to construct a monument with a memorial plaque for all those whose eternal rest—since the 17TH century— was disturbed, mostly by Nazis. In 2008, on the anniversary of Kristallnacht, Nathan gathered his extended family of about 60 relatives from all over the world who, together with the town’s elders and many local citizens, helped unveil a memorial to honor the Jews buried there, including generations of the Nathan family. “I invited even my youngest grandchildren because they should all know and see where their family originated and how their ancestors labored under difficult circumstances, but had the stamina and guts to overcome them,” says Nathan. Those ancestors were the forefathers of what is now a large global family, mostly in the US. 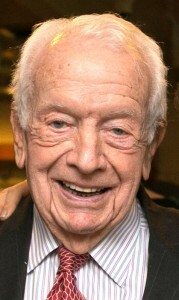 Nathan’s strong convictions about the importance of history also led him to include Leo Baeck Institute in his estate planning. His gift will help ensure that the institute’s collections, focused on the history of families like his, will be available long into the future. LBI collections will someday also be enriched by the documents, photographs, and books dating from the 19th century through the 2nd World War that Nathan plans to entrust to the LBI Archives. Among other things, they tell the complete history of the shoe manufacturing company “Ada-Ada,” which was started by Nathan’s father and uncle in the year 1900. By the time it was “aryanized” in 1937, it produced 1 million pairs of shoes per year and employed more than 1000 workers in the Frankfurt suburb of Hoechst. It was a great success story for a Jewish family originating in Gau Algesheim who moved to Frankfurt at the end of the 19th century. “Future researchers will be able to use these records to help explain what made this period of German history such fertile ground for extraordinary achievements in politics, business, art, science, and culture,” says Nathan. Although family papers like those in the LBI Archives are priceless, the costs of cataloguing them, preserving them, and making them available to researchers online for the long term add up quickly. Financial gifts like the one Walter Nathan has planned will help strengthen Leo Baeck Institute’s ability to serve as guardian of these materials for generations to come. 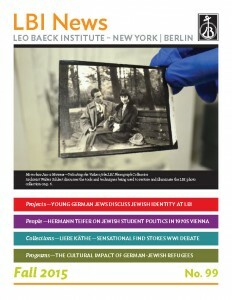 Please make a bequest to the German-Jewish Legacy Fund and help preserve our unique archive, library, and art collection. If you are interested in planning a gift to Leo Baeck Institute in your will, or if you already have,we encourage you to call us at (212) 744-6400 to discuss your options.